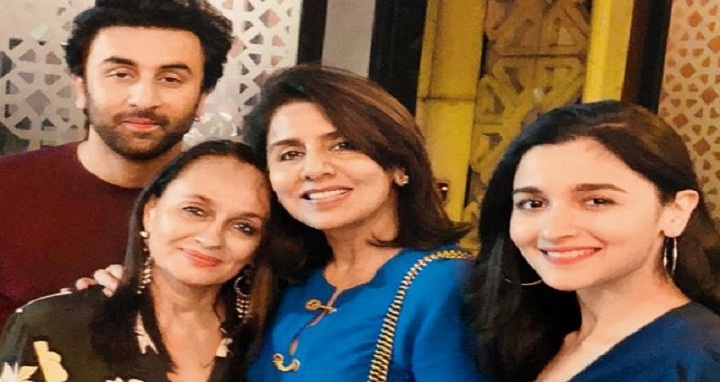 Dhaka, 29 September, Abnews: Neetu Kapoor on Friday wished son Ranbir on his 36th birthday by sharing a photograph with Alia Bhatt and her mother, Soni Razdan. She wrote, "Happy birthday to my friend, philosopher and guide. Loads of love and duas (sic)." The picture is said to have been taken at a dinner hosted by Ranbir's aunt, Rima Jain, who shares her birthday with him. Alia also wished her beau on social media. She wrote, "Happy birthday sunshine (sic)." It's almost official now! On the work front, Alia Bhatt and Ranbir Kapoor are currently shooting for Ayan Mukerji's next flick, Brahmastra, along with Amitabh Bachchan. The film also stars Mouni Roy and Nagarjuna in pivotal roles. The fantasy drama is slated to release on August 15, 2019.